My mother made this bunny-shaped cake for us in the Sixties. I made it for my kids in the Nineties. Now, twenty-five years later, I am happily making it for my grandson. I love the architecture involved in creating the bunny shape out of two round cake pans as much as I love the simplicity in the flavor of a vanilla cake. Place the flour, sugar, salt, and baking powder in a large bowl and mix on slow speed until well blended. Add the slices of butter and blend on medium speed until the mixture resembles pea-sized crumbles. In another bowl, mix together the eggs, milk, and vanilla with a fork until well blended. Pour the wet ingredients into the butter and flour mixture and beat on slow speed for one minute. Scrape down the sides of the bowl with a spatula. Beat the batter on medium speed for one minute until smooth and fluffy. Pour batter into prepared cake pans. Bake for about 25 minutes on the middle oven rack. When done, the cakes should be golden in color and a knife poked into the center should come out clean. Remove cake pans from the oven. Let cool on a wire rack for ten minutes. To easily release the cakes from their pans, use a knife to loosen the edges and then flip the pans onto a rack. The cakes must be completely cooled before frosting. Beat butter and cream cheese together in a large bowl on medium-high speed until smooth and creamy. Add powdered sugar and start beating on slow speed until the sugar is incorporated into the mixture to keep powdered sugar from spraying all over the room. Beat frosting until smooth and creamy. Add vanilla and beat for 15 seconds more. Add milk as needed to help fluff up the frosting. Cut one of the cake layers as shown. Arrange cakes as shown below. Place parchment paper strips under the cake’s edges. Ice the cake and then remove the strips. Decorate with M&M’s. My husband got into decorating the cake. I had to pull him off the job when he talked about applying eyebrows. Meanwhile, a few miles away at my Goddaughter Leigh’s house, my dear friend Becky was busy making an Easter Bunny Cake for her three-week-old granddaughter. She sent me a photo. The Barton/Meadors family made this beautiful bunny. My friend Janet Davies sent a photo of her coconut-covered bunny cake. Here is her method of icing the cake: Cut each cake layer in half horizontally. Poke holes in the layers with a toothpick. Pour a mixture of 12 ounces frozen coconut, 1 pound powdered sugar, and 1 cup sour cream over the layers and allow to soak in. Add flakey coconut to the top. The sour cream gives it a tangy touch. Sometimes she takes off the crusty of the cake to make sure the runny icing gets inside the cake. Here’s another cute one sent to me by mom’s cousin, Jean Maroney. Her daughter-in-law, Alena, made it. If you are celebrating Easter, Happy Easter! When a cookie can transport me back to a summer afternoon in the jalousie-windowed sunporch of my grandmother’s house, complete with a tableful of visiting Italian relatives sipping coffee, that’s a pretty powerful cookie. Such was the case when, after many attempts, I came up with a recipe for these Italian Sesame Seed Cookies. When I finally got it right, I fixed a cup of coffee and dunked the cookie in; the ultimate taste test. The taste was just as I remembered: light, buttery, nutty, and slightly crunchy, all of it made even more flavorful by the milky coffee. I didn’t normally drink coffee as a young girl, but when the sesame seed cookies were out, my grandmother always gave me a cup so I could dunk with everyone else. Heaven on Earth. Addictive, too!. Sesame seeds come from the fruit pod of the sesame plant. The plant is an annual, and the pod grows very similarly to okra (photo on the right). Once the pods dry, they are turned upside down allowing the seeds to fall out. Here is a photo of the unhulled seeds and dried pods. When baking with sesame seeds, use hulled, untoasted seeds. I purchase them at the Indian grocery store, Patel Brothers, or from the bulk dispenser at Whole Foods. You need about two cups, so it’s best to purchase in bulk rather than in small cans. Life for many seeds and nuts laden with oils, sesame seeds become rancid when sitting in a cupboard for a long period of time. Thus, if you are not going to finish the package soon after opening it, store it in the refrigerator or freezer. A rancid nut or seed can quickly ruin any savory or sweet dish. Often, you can tell if the seeds or nuts are rancid simply by the smell. Even without a rancid smell, I do a taste test to be sure. 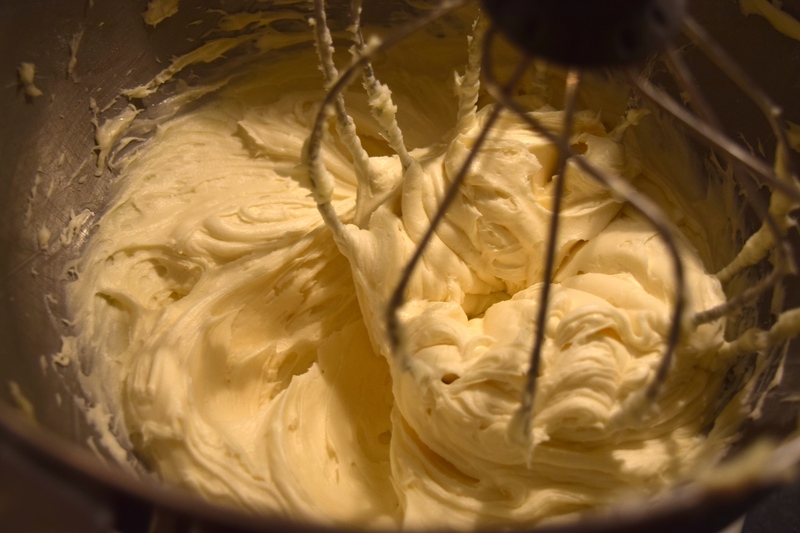 Cream butter in a mixing bowl on medium speed for about one minute. Add the sugar and cream for another minute until batter is light and fluffy. Add eggs and vanilla and mix one more minute, still on medium speed. 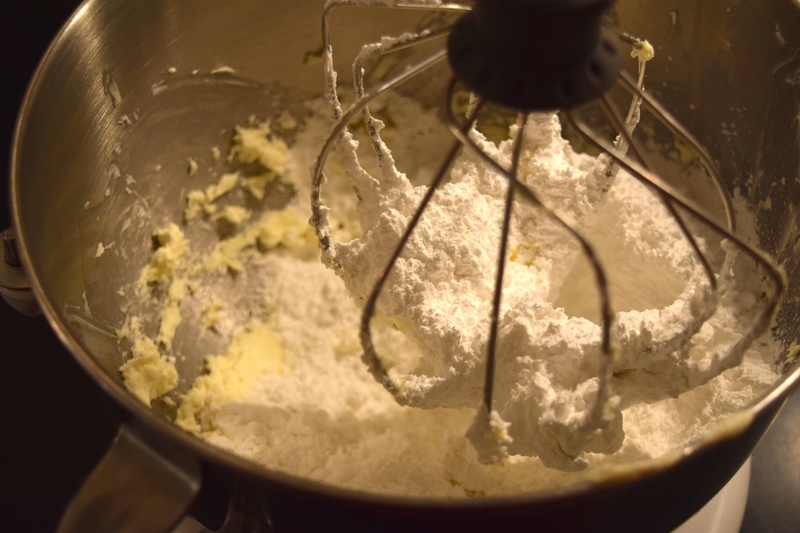 Combine baking powder, salt, and flour in a bowl and stir with a wire whisk. Add dry ingredients to batter. Mix on slow for 30 seconds. Do not overwork the dough. Spread flour on countertop and fold dough over on itself about ten times. Divide dough into four equal sections. Roll each section into ¾-inch thick ropes and slice those into two-inch pieces. My relatives would pull off a clump of dough and roll each cookie into a small oval log, but I like to do it this way because there is less handling of the dough. Set-up two wide-mouthed bowls, one with milk and one with sesame seeds. Put about a cup of milk in one and 1½ cups of sesame seeds in the other. Pick up about 5 pieces of dough and put them in the milk. Then lift each piece of dough and roll it in the bowl of sesame seeds. Arrange dough on parchment-lined baking sheets. Bake for about 25-30 minutes, or until cookies become lightly browned. Let cool five minutes and then move cookies to a cooling rack.